If you are looking for a single security package that protects all your devices, McAfee LifeSafe is the right choice for you. 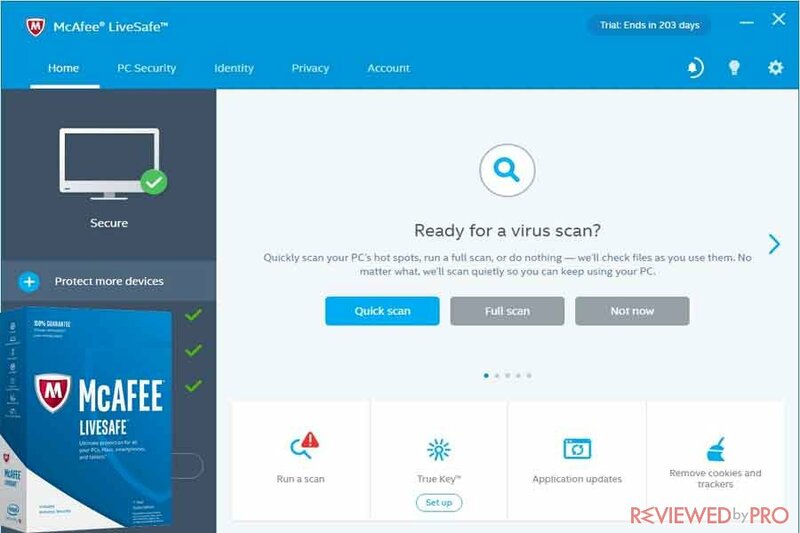 McAfee LifeSafe is a complete antivirus and Internet security software that provides users with optimal web security, identity protection, and protected cloud storage. McAfee LifeSafe provides an award-winning protection for all your devices on every operating system including Windows PC, Apple iMac protection, iOS phone and tablets and Android devices. McAfee LifeSafe provides award-winning protection for a limitless number of devices for you, your family and friends. It is compatible across all your devices: with a desktop, tablet, mobile and even wearable devices and technology. McAfee LifeSafe is also Centrally Managed and provides security from a single console. One Single Subscription is required in order to cover all your security needs. 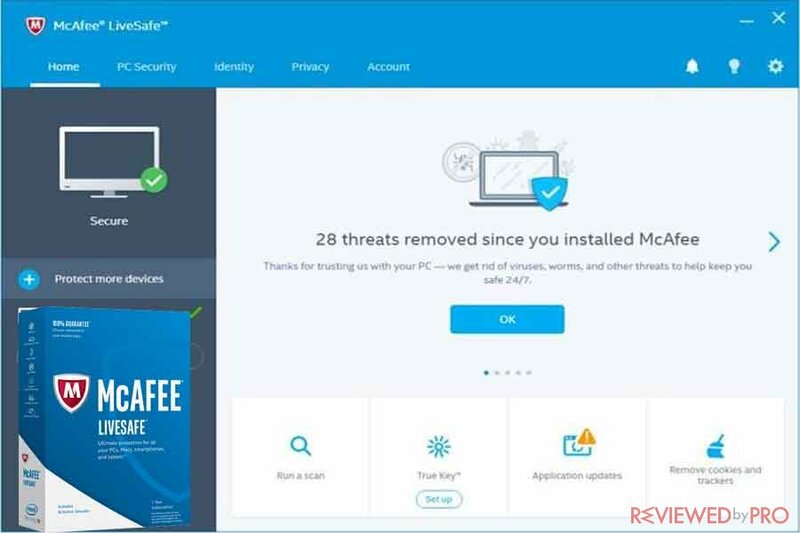 McAfee LifeSafe provides users Customized Protection that protects against threatening activities and allows you to customize the level of security according to your needs. In addition, Control Network Access allows you to record the information transfers between devices on your network. Sophisticated Filters blocks and removes suspicious incoming internet traffic and malicious software that attempt to steal information. Finally, Malicious App Block will protect you against malicious apps that might send personal information over the Internet. The Anti-phishing system automatically detects emails that attempt to expose your personal data to malware or trick you into sending your data. 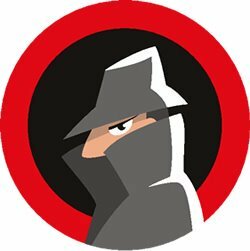 The Anti-spyware feature will stop any spyware that potentially can infect your devices and share your information with unauthorized parties. Anti-spam filtering feature will prevent and protect you from unsolicited emails. 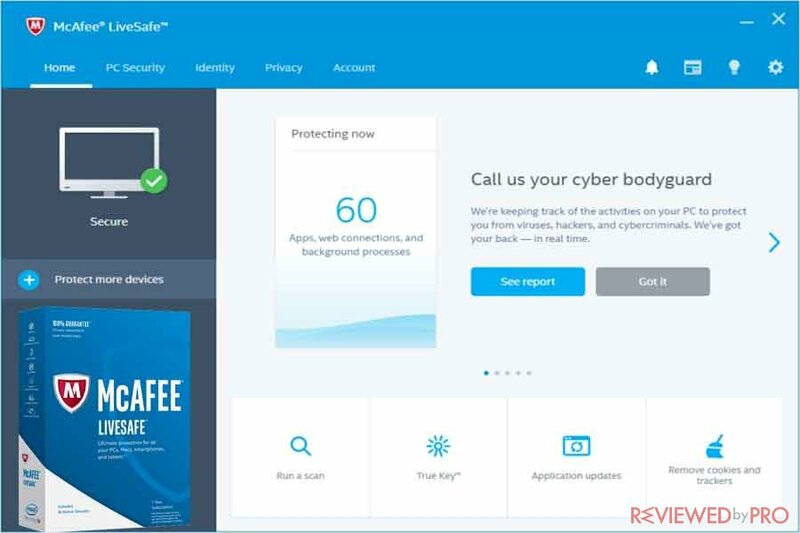 McAfee LifeSafe offers you set of features that will protect your online activities: protected mode, site rating, social media protection and secure search. Using McAfee LifeSafe, Screen-time management, you can set the time your children spend on the Internet, monitor and manage the websites they visit. McAfee Content Filters allow you to block or allow websites based on your children’s age. Safe Search Filters feature also manages search engine safety filters, so inappropriate content is excluded. Child activity log also enables you to find out who is visiting blocked sites or browsing outside set up hours. Biometric Login feature enables you to sign in without passwords. Instead of passwords, you can log in with fingerprint or facial recognition. Password Locker will allow you to store your passwords locally on any of your devices and sync them to your account. Secure Auto-Login feature will provide you a capability to log in automatically, as True Key can enter your details for you. Finally, all of your passwords are fully synchronized automatically across all your devices. McAfee LifeSafe enables you to remotely back up, restore and wipe your personal files and sensitive information from lost or stolen device. In addition, you can locate and lock your lost mobile device, through your centralized McAfee account. S.O.S feature will provide you an emergency location update from lost or stolen phone when its battery runs low. Finally, CaptureCam feature will allow you to locate your stolen phone and get a picture of the thief. McAfee LifeSafe also provides its customers with Mobile App protection, including malicious app protection that allows you to prevent unlawful installation of suspicious and malicious apps on your device. In addition, app privacy protection feature controls your personal information and device functions that app can access and change. The App lock function enables you to lock your device with PIN codes, in order to control access while others use your device. Memory cleanup provides users an ability to close unwanted background applications to improve device’s speed, free up memory and save its power. McAfee LifeSafe offers its customers a new, simple, and easy to use interface. The intuitive interface is optimized by the device and provides you instant access to all features. The Custom scheduling feature allows you to schedule regular scans for your devices, systems, discs, and folders. Finally, fast and simple scans can scan your apps in a minute, ensuring your device is protected. Secure payments that will allow you to shop, pay safely and manage your finances with no risk. Prevent Data Theft feature enables you to connect to your data with confidence and makes sure that your data won’t be compromised or exposed. Ad Blockers will stop suspicious and malicious pop-ups from spying on browsing habits and other dangerous activities. Secure Cloud Storage. Using McAfee online vaults, you can access your information and files wherever you go. McAfee LifeSafe provides its customers the highest quality online security. It protects you online, so you won’t have to worry about identity theft, fraud or phishing attacks. You can be sure that the data will be secured and protected while you are browsing online. McAfee LifeSafe protects your Wi-Fi networks and secures your files and connections. McAfee LifeSafe offers advanced online banking security. McAfee LifeSafe provides encryption system every time you log in to your online banking. In addition, the online banking security creates and remembers strong passphrases. Finally, advanced anti-phishing filter improves your banking safety. McAfee LifeSafe provides you with safe access to your information from any device whenever you want. It also enables you to lock and encrypt all of your important information and files in secure digital vaults on your PC. Finally, it enables you to lock your device and delete all of your sensitive data remotely. Users can easily check the security level of all your devices from one console. In addition, the protection is updated automatically with the most recent threat definitions available. You can also get instant access to a code to protect your devices. McAfee LifeSafe is produced by McAfee Inc., the American-based IT security company. The company was established in 1987, and since then McAfee offers its customers' Internet security software and antivirus products for home and businesses users. This entry was posted on 2018-01-11 at 08:47 and is filed under News.